I guess it's pretty obvious, but my best advice to anybody trying to go into a creative field is to never stop doing what you love. I don't just mean related to your field, either. Like, of course I never stop writing. But it's important to continue doing the things you love outside of writing, because, in my experience, those things will come back to improve your writing. But music was always the one thing that I put tons of effort into learning and getting better at, with no intention of ever making a career out of it. It was the one thing I did solely for the enjoyment of it. And somehow, music ended up being what got me one of my first jobs out of college. 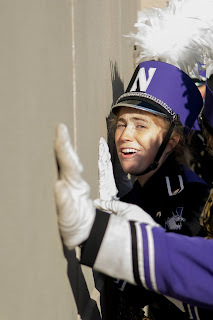 My first recurring paid writing job was (and still is, since I still write for them) writing for Halftime Magazine, which reports on marching bands and drum corps around the world. I got this job not just because I could write, but also because I spent eight years in a marching band. Not only do I still work for Halftime, but having them on my resume has also helped me find additional writing jobs. I never would've gotten any of that if I'd given up music. So, I guess my point is this: while it is important to focus, and to devote the most energy to your career, you don't have to give up everything just to make it happen. Sometimes, doing things just because you love them will end up helping your career in ways you don't expect! To all my fellow writers out there, keep doing what you love!